Hello, my name is Kirsten and I have a problem. I like to make chili using not-the-usual vegetable suspects. 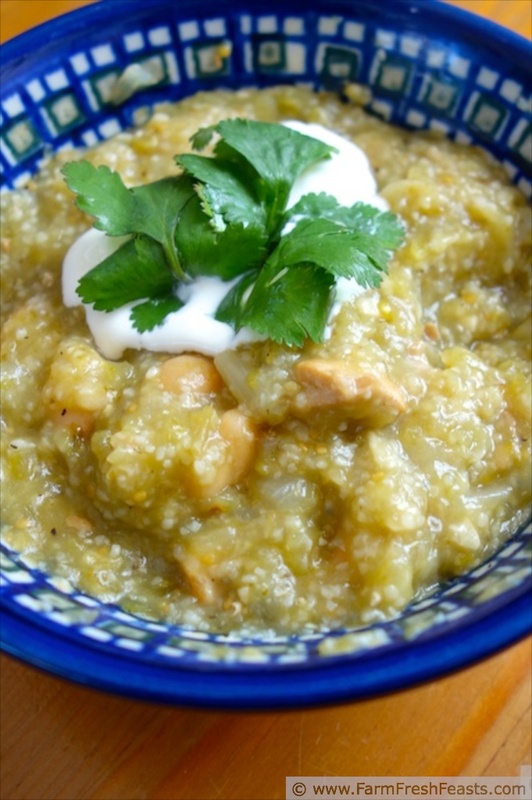 It all started with this Green Tomato Garlic chili recipe a year ago. I liked it so much I put up a couple of quarts of chopped green tomatoes in the freezer for winter chili. Instead of making more green tomato chili, however, I veered off in a squash and beet direction with Acorn Squash, Beet, and Sweet Potato chili. Then I used a quart of the green tomatoes for Green Tomato Bacon Jam. This chili has cubes of pork, Great Northern beans, and my put up salsa verde. I wanted a thick chili, so I added some grits and wow--that did it for me. We liked this chili with a swirl of sour cream stirred into each bowl. I bet my corn cheddar bacon muffins would be great with it. If you're having a chili cook off, this would be a little something different. It's easy to fix (the slow cooker does most of the work) and the flavor is wonderful. 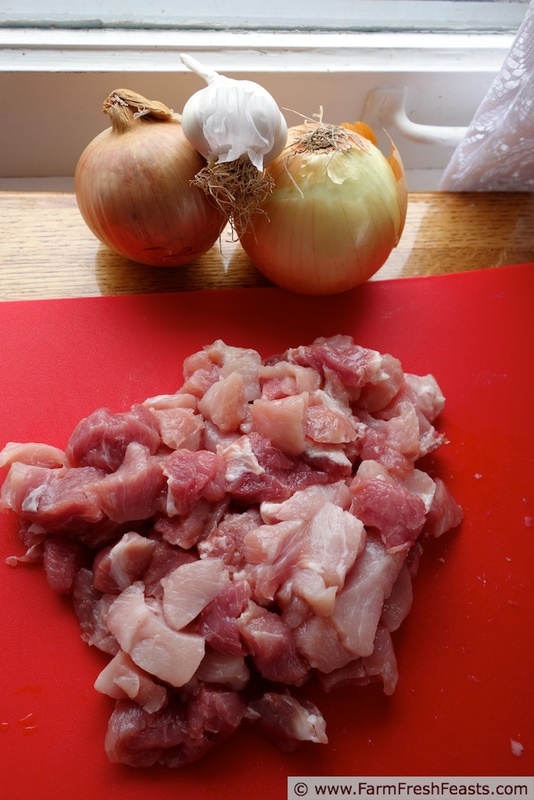 This is also great for a work day meal--brown the pork the night before while the kitchen is still active with dinner, chill it overnight, and dump all the ingredients into the slow cooker the next morning. Note to self--this fall, put up more quarts of chopped green tomatoes! In fact, I think I'll put the word out with my neighbors that if they don't want their tomatoes still on the vine when the first frost is predicted, I'll be happy to come harvest. The cool thing about green tomatoes is that they can hang out on your counter for a few days until you can process them. What's the worst that can happen--they start to ripen? Oh, the horrors. Preheat a large skillet over medium heat, add a turn of cooking oil. Brown the pork cubes on all sides, stirring every few minutes to flip them over, until evenly browned (about 8-10 minutes). 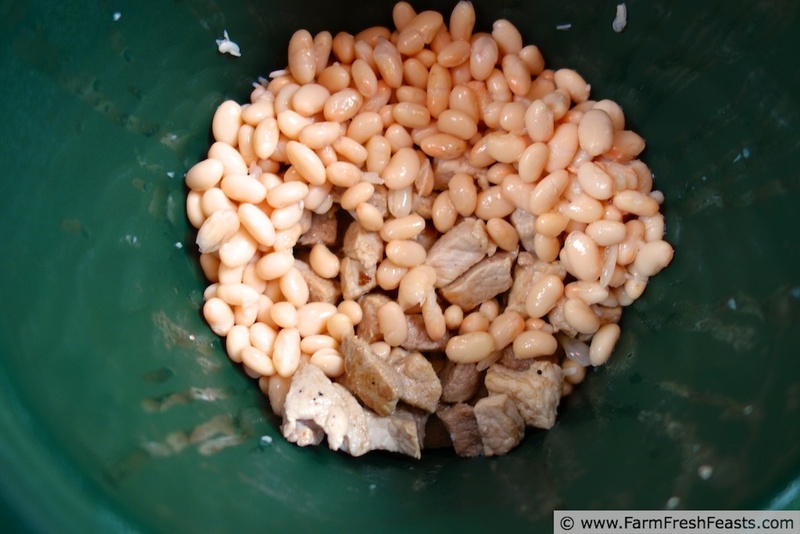 Transfer to a slow cooker. Dump the rest of the rest of the ingredients--except the optional grits--on top, stir to combine. Cover, PLUG IN, and TURN ON SLOW COOKER to Low. Yes, I am shouting! I constantly forget one of those key steps, and it's really important to both connect the slow cooker to a power source and turn the knob/press the button to start it. If I plan to have the slow cooker doing its thing while I am away for the day, I will set my car keys next to it when I set it up, then as I am running out the door I'll fetch my keys and double check that the slow cooker is in fact working. Cook on Low for 6-8 hours or High for 3-4 hours. About 30 minutes before you're ready to serve, give it a stir and see if you like the thickness. If so, you're all good--get the sour cream and other garnishes ready. 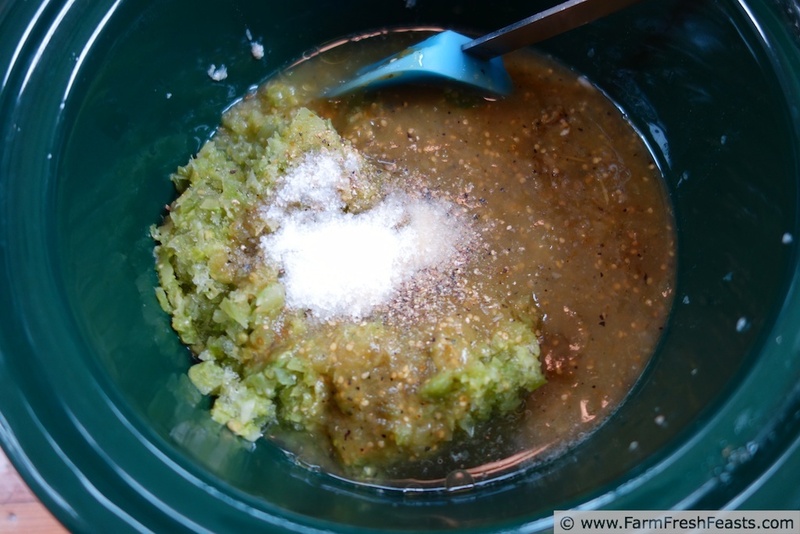 If you'd like it to be thicker, stir in 1/3 cup of quick cooking grits and re-cover the slow cooker to let the grits work their magic on your creation. This post is shared on the Wednesday Fresh Foods Link Up and What's Cookin' Wednesday, What's In The Box, From The Farm Blog Hop, Clever Chicks Blog Hop, Tasty Tuesdays, Food on Friday, Foodie Friends Friday. Thank you for all your great green tomato ideas. This September has been pretty chilly, so I'm not sure all my green tomatoes will continue to ripen. This looks delicious! I'm glad to share ideas for not wasting perfectly edible food. I'm hoping to have a couple of fresh tomatoes for my spouse when he returns later this fall, but the rest can be put up for later. I love chili in the Fall, and I love you don't stick to a traditional recipe. Those are for the birds. This sounds great and reminds me I need to do more with my slow cooker. Especially because I have two of them now. I'm all fancy. There's something to be said for traditions, though. I mean (lutefisk aside) a food becomes traditional because it tastes good, you know? Slow cookers, pizza stones . . . you are pretty fancy. Do you have an asparagus steamer? That is the ultimate in fanciness to me. No asparagus steamer here. Two out of three ain't bad though. Did I just lose points for using the word ain't? You can't call kitchen innovation and inspiration a problem. Go with it and use your powers for good! Thanks for the inspirations! If only my powers tended towards dusting, window washing, and general cleaning. Funny you should mention it, I have 3 green tomatoes sitting on my counter right now, because I plan to fry them tomorrow evening and I cannot be home for dinner tonight, so they have to wait, and it *will* be horrible if they ripen before tomorrow night! I like your idea of grits to thicken your chili (nothing bugs me more than watery chili). I always use masa harina, but grits are much easier to come by in some areas. Very cool! As you may see next week (in a necessity is the mother of invention sort of way) I used the grits because I had them. Apparently some people in this household don't care for grits. Fools, them. I'm realizing there's a lot of untapped potential in green tomatoes. Do you have a recipe for putting up the green tomatoes? I need one! I just chopped mine (feeling lazy, used the food processor) and froze them in zip top bags. 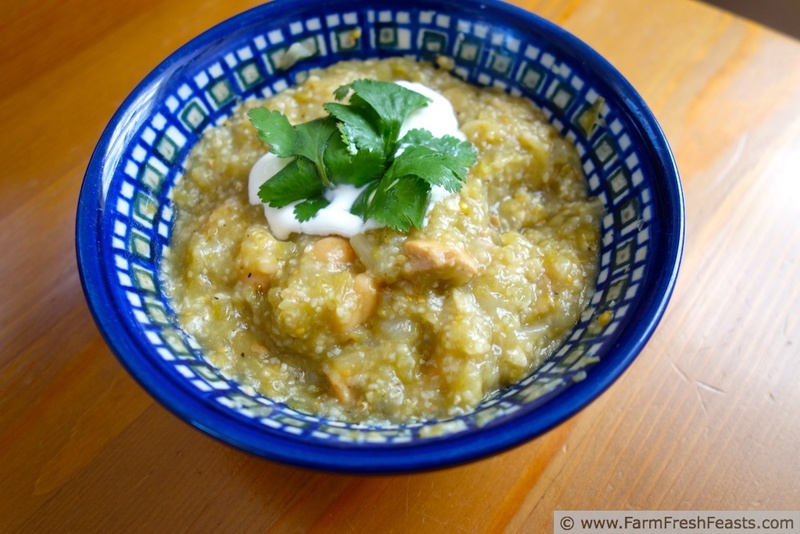 You can see them here: http://www.farmfreshfeasts.com/2012/10/slow-cooker-green-tomato-garlic-chili.html . If you don't wish to use plastic, they'd freeze fine in jars, with plenty of head space for expansion. If you have no freezer room, I have no idea if it's possible to can them. OK I "stole" your photo to share this on FB. YUM! I clearly don't make enough use of green tomatoes. Pinning now! You know how to "steal", so please feel free to share! It's amazing all the ways you can eat food, you know? I still would like to know what the first person to eat an artichoke was thinking. Looks delicious and perfect for this suddenly crisp weather- have plenty of green tomatoes that I doubt will ripen now, even with the extra lime I amended to the soil a few weeks ago. I didn't know about the link between lime and ripening--thanks for that! We went through years of not eating chili when we lived in Hawaii. I guess the weather was just never Chili Weather to me (boy am I glad I'm not a food blogger in Hawaii--I can't imagine trying to come up with fall/winter dishes while living in the tropics! We went out for Thanksgiving more than once, just to get the food we wanted without heating up the house.) Thanks! Thank for sharing and linking up! G'day! What an interesting combination, true! Who knew making chili could be this easy! Great photo too! I'm all about the easy--as long as it's tasty, too! Thanks for visiting! 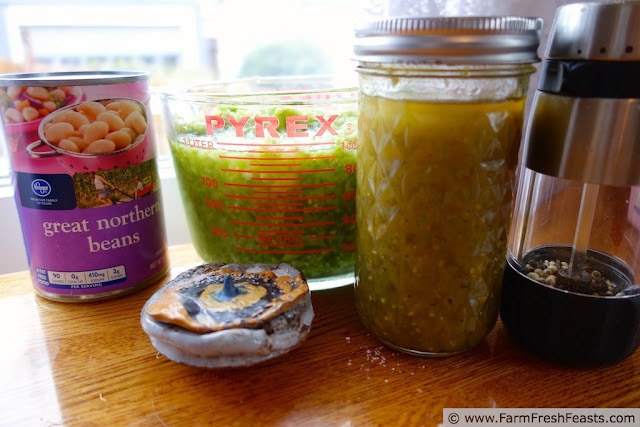 I'm not a huge grits fan, Kirsten, but I love the idea of adding it to chili as a thickener. I happen to have many friends in the south, several of whom regularly send me grits from a historic nearby mill that is still operational. So I've had several bags of grits in the freezer. Now I know what to do with them! :) This looks delicious. How lucky to get local foods from your friends--and how clever of you to keep them in the freezer. I have ugly photos of a tasty Blueberry & Grits Breakfast Cobbler on the site that was delicious. At some point I need to get more grits to make it again. Kirsten, this sounds so delicious! I love green tomatoes, and sadly we don't get them in our bin around these parts. Wah-wuh. Excited to bust out my crock pot soon though! I was shocked to see green tomatoes at the grocery store last month. Someone smart put them in a different area than the tomatillos, hopefully to avoid confusion, and I thought that was pretty cool. I'm glad for crockpot weather--ties in with my busy Fall.